The Final Fantasy Series Relay Race III is going on right now, with three teams of seventeen people competing to see which can beat every game in the series first. Begun back in 2015, the annual event is streamed across several days with speedrunners on each team dedicating themselves to completing a specific Final Fantasy game before handing it off to the next teammate in line. Understandably, the MMOS, Final Fantasy XI and XIV were left off the list, which instead includes spin-offs X-2 and the complete XIII trilogy, as well as Type-0. While some games like Final Fantasy VIII and IX are stingy with shortcuts (both games were finished in a combined seventeen hours), others like Final Fantasy I can be completed in under two hours. The NES version of Final Fantasy III, for instance, a game that was never released in the West until it was remade for the DS decades later, can be finished in under an hour (the current world record for completing any percent without utilizing a credits warp glitch is 47:26). But doing so requires some precise manipulation of a handful of the game’s glitches and, most importantly, the game’s random encounter system. That’s what speedrunner ZellyFF was trying to do when he was attempting the game as part of Team Mog. The group came into the third game in the series with a decent lead, and ZellyFF was coasting through its early sections. Later, however, as he made his way through the game’s final dungeon, “Dark World,” something unexpected happened: a random encounter. Nobody likes random encounters. There’s nothing quite like wandering through a dungeon looking for treasure and the exits only to be hounded by the same gang of monsters every five feet. For speedrunning, however, they are an especially heinous obstacle, so keeping them to a minimum is an absolute must. As a result, despite being the first to the dungeon, he was eventually passed by the players on Team Choco and Tonberry. Dark World is a ruthless dungeon even at the best of times, but hitting any snag at all can spell certain doom for a speedrunner. There are only supposed to be 30 fights in a perfect game of Final Fantasy 3: two goblins in the first dungeon, the boss, then later some skeletons to get a particular item, then a few more encounters to trigger glitches that let players exploit the game’s job system to power characters up, and from there only boss fights. Because manipulating the encounter rate requires a precise count, any unexpected result can completely unravel things with no room to recover. He started practicing the run for the first time three months ago, achieving a time closer to just north of an hour, instead of the 1:37:09 he ended up with during the relay (the contest organizers decided to move Team Mog onto Final Fantasy IV in the interest of time and to keep the commentating in sync with the games). The relay race is still going on and not expected to finish until sometime tomorrow. 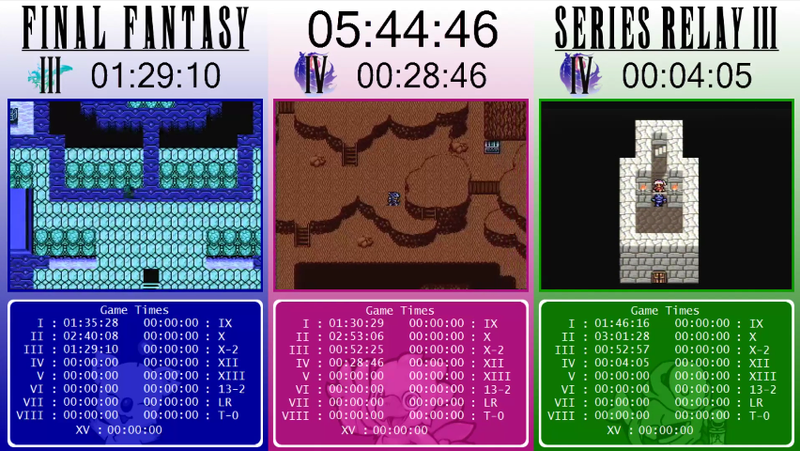 You can watch the teams’ runs for Final Fantasy III below.